Just as it is with our custom, here on DroidAfrica we begin our smartphone specification collections, once the product shows up on any certification authority website. And since the launch of ZTE Nubia Z18, we’ve been looking around to begin specs collections for the next ZTE smartphone. But we’ve not been successful until today. Get ready for the ZTE Nubia Z18S. It seems the launch of ZTE Nubia Z18S is by the corner as the device has been certified today China with the model number NX616J. As you should have probably known by now, every OEM looks for one thing or the other to entice buyers attention to their new product alterations. To some OEMs, it either their increased CPU performance, (thinking Apple or Huawei right now) or software tweaking (Xiaomi), and so on. Well, as for nubia, we’ll read on! 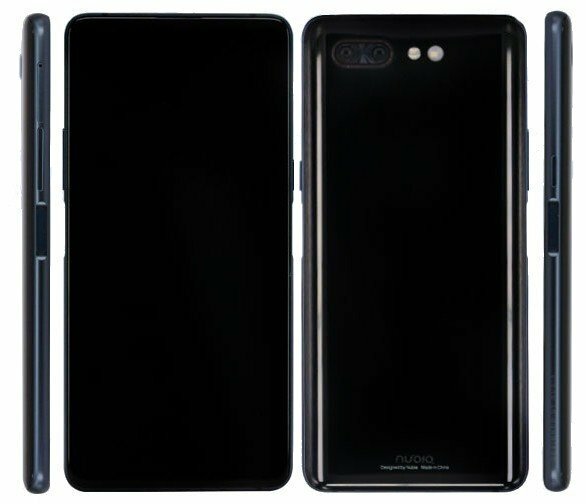 According to the certification, it is revealed the upcoming Nubia Z18S will not only pack dual display (front and back) but will also feature dual fingerprint scanner – strange? There’ll be a 6.26-inch FHD+ LCD screen on the front and a 5.1-inch HD+ AMOLED screen on the back. The aforementioned dual fingerprint scanners are placed either sides of the smartphone, just below the volume rockers and power button. Ok, I think I better hold my Peace till when next the ZTE Nubia Z18S shows up again. But below are the rumored specifications and features. The Nubia x is expected to come in Gold and Black color. It could go official in the coming weeks. But take the news with some pinch of salt, let see what we can gather before you go dancing.